-Sunday, October 20, 5-7pm, Tap Takeover at Tavern on South (423 W. South St. 46225) immediately preceding Colts vs. Broncos! Tailgating Triton-Style! Join us to get ready for the 8:30pm Kickoff! -Saturday, October 26, 6-8pm, Beer and Candy (Kahn's North Willow, 2342 W. 86th Street) join us for Kahn’s Annual Halloween themed beer tasting! Join us at North Willow for a costume contest, ‘Beerocracy raffle,’ and help us answer the question, "Are you afraid of the Beer?" Be there, or be scared! -Thursday, November 7, Triton Tap Takeover at Tomlinson Tap featuring: Gingerbread Brown, Nobody's F'Alt Oktoberfest, Railsplitter IPA and a Porter available only at the Brewery and Triton Tap (Broad Ripple)! Our next seasonal will be our Hot For Teacher Ms. Dopplebock. We will be tapping it on Tuesday November 5th! Make sure to mark it on your calendar. Our list of great establishments pouring our beer keeps growing. One of our newest locations is Old Point Tavern on Mass Ave. You can find a full list of locations on our website. All Scotty’s Brewhouse locations are now pouring Thr3e Wise Men Breaking Barn Milk Stout! Come by on Sunday to get a pint of any Thr3e Wise Men Beers for $2.50 a pint. One week to go for ticket sales to The Great Pumpkin Beer Fest! ○ Organization of volunteers dedicated to improving the lives of children in the Broad Ripple Community. We meet every Tuesday at noon at Binkley’s Kitchen &; Bar. One of the Girls' Pint Out founders, Jenn Litz, had the opportunity to brew a special beer with New Belgium Brewing. The beer, Sin & Tonic, is a take on a gin & tonic beer cocktail made with Sorachi Ace hops, juniper & citrus spice-blend and even some quinine were employed in the production of this rarity. 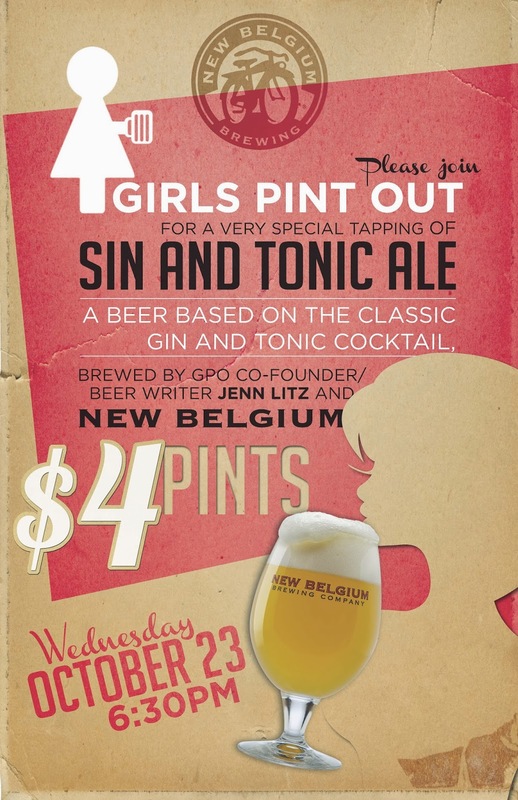 New Belgium is sharing this special Girls' Pint Out collaboration beer with Girls' Pint Out chapters across the country! Join us as we tap this special beer with other girls loving beer and chat with Jenn Litz about her special beer via webcast! Pints are only $4 - and if you arrive early enough you'll get a free New Belgium pint glass. This is the ONLY keg of this beer in Indiana! Don't miss it!